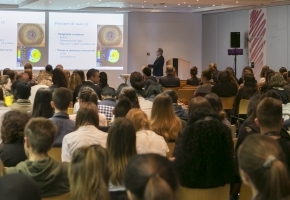 SILMO ACADEMY has carved out a niche for itself as a forum for dialogue and information on the latest scientific developments in the vision and optics sectors, aimed at opticians and other vision specialists both in France and abroad. In line with tradition, this symposium will take place within the framework of SILMO Paris, World Optical Fair on 23 - 26 September 2016 at the Paris Nord Villepinte Exhibition Centre. This is a unique opportunity to have your say, a platform to share your thoughts, analyses and scientific studies directly. The 2016 symposium is dedicated to READING, a key function whose impact on the cerebral cortex is more more extensive than was previously thought. Opticians and other vision professionals need your input to improve their professional practice on a daily basis. Play a key role in this enhancement! Inaugurated in 2010, SILMO ACADEMY arose from an observation that opticians need to develop their skills and broaden their knowledge in the fields of vision and optics in order to meet their clients’ visual requirements more effectively. SILMO opted to support professionals in this strategy by creating a dedicated training body and science symposium, aimed at all professionals wishing to enhance their expertise. As a forum for improving knowledge and sharing experience in the various aspects of vision and compensation for vision loss, it is recognised under the Continuing Professional Development programme. All participants can register as part of their CPD for healthcare professionals, which became compulsory in January 2013.